Apple TV is one of the low budget Apple iOS device from a company which provides total entertainment to its users. The price of the Apple TV is low as $99.00 contains powerful hardware specification includes Apple A4 chipset with a PowerVR SGX535 and 256 megabytes of RAM, running modified iOS builds from those on iPods touch, iPhone touch, and iPad touch. 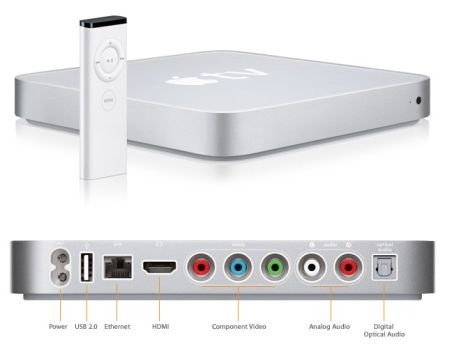 Apple TV exists as a media center settop box officially but users can also Run any iOS Applications including apps from iPhone, iPod and iPad on jailbroken Apple TV unofficially. There is one video available on internet which provides you an evidence of running iOS Apps on Apple TV. The video shows demo of some iOS Apps like Facebook, Maps, Safari and YouTube on a jailbroken Apple TV. This is not AirPlay, the apps are running directly from the Apple TV and scaling to 720p. According to MacDaddy News, MobileX is a window manager for iOS that replaces Springboard, letting iPhone and iPad apps run on the Apple TV. Since the Apple TV doesn’t have a touch screen, they are using a combination of VNC, SSH and the Apple Remote to launch and navigate apps. Once the app progress finalized by two developers, you will be able to launch apps using only the remote. I think its one of the cheapest way to run iOS Apps directly on $99 Apple TV.